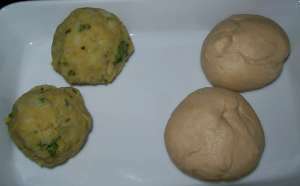 Potato bread (Aloo paratha or Alu paratha in Indian languages), is one popular Indian Bread recipe. Aloo Paratha can be part of breakfast, lunch or dinner or as a snack. It is easy to prepare. You can prepare the stuffing as well as the dough in advance. You can keep it in the fridge for 2-3 days. 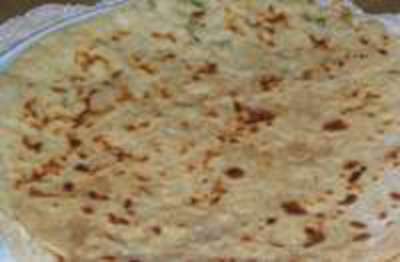 You need only a few minutes to make parathas as and when you want. Serve Aloo Parathas with pickle, curry, or just with plain yogurt. It can be a one dish meal too. You can take it for lunch to office or school or on a picnic. Boil potatoes. Mash them finely. (I use a grater to grate them and then it is easier to mash). 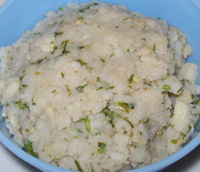 Add green chili paste, ginger paste, garlic paste, salt, coriander leaves to mashed potatoes. Mix well. 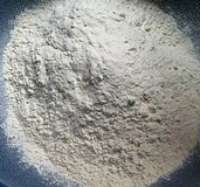 Mix whole wheat flour, salt, oil. 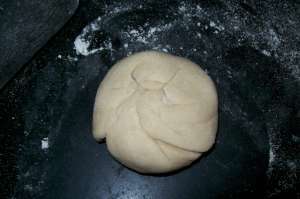 Add water little by little to form a dough ball. Knead well. Keep aside for 20 min. Knead again after 20 minutes and divide the dough in big lime sized balls. Making Aloo Parathas - Potato stuffed flat bread. Take one dough ball. Dip it in dry flour. Sprinkle a little flour on the board and put the dough ball on it. Using a rolling pin, roll a small round. Place potato stuffing on that round. 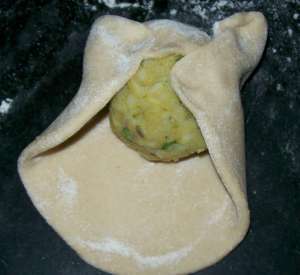 Cover the stuffing with the dough from all sides and form a ball again. 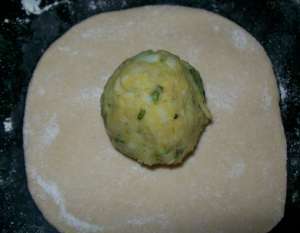 Roll lightly the paratha in to a thick circle. Sprinkle a little dry flour when necessary so that it doesn't stick to the board. Heat a girdle and place the paratha on the hot girdle. Add a little oil on it. When it has light brown spots on one side, turn it using a spatula. and cook it on the other side till it has golden brown spots.Take off the girdle. Prepare all the parathas in the same way. Serve hot with any curry, pickle , tomato ketchup or a cup of Curds(plain yogurt).